When the set pressure is reached, the portable car air compressor automatically shuts off. It can remember the pressure value set before unplugging the power for next time use, and can also deflate value. The air pump inflates the tire quickly at 35L / Min, Inflate a regular car tire from flat in just 5-6 mins. You can inflate tire by yourself whenever and wherever. Don\'t need to waste time to wait a repairman anymore. With portable compact design makes it easy to lift, easy to carry around. The power cord is 3m / 9.84ft with air hose 0.6m / 1.97ft which can absolutely reach to any of the 4 wheels and further. When the tire\'s pressure is in a low condition, the tire might blew. 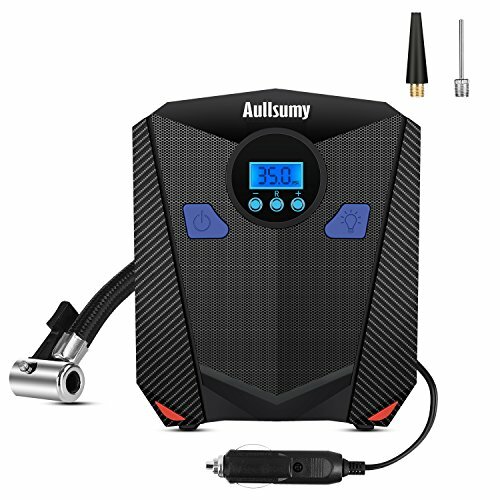 The car tire inflator can be used to test the pressure of the tires whenever necessary. ▪️The air compressor can not be used in large vehicles such as big truck, RV, etc. ▪️The portable tire pumps only can be used on DC 12V/10A power source. If you want to use the air pump at home, you should buy a AC to DC power adapter( 110V to 12V ).